Whenever music wants to renew itself, it needs new methods. In the mid-20th century, composers like Earle Browne, Morton Feldman, John Cage or Karlheinz Stockhausen experimented with alternative notational systems and flipped the Western music tradition upside down. From March 8th to the 10th 2019, the Letra / Tone Festival for Graphics and Music will pick up where they left off and, after a successful first instalment in 2014, again bring together nine graphic artists with nine musicians. Graphic art provides the input, while the output comes in the form of unique musical performances by drummer Andrea Belfi and sound artist Jessica Ekomane, the modular electro duo Blotter Trax (Magda and T.B. Arthur), the experimental duo Demdike Stare, the turntablist Dieb 13, industrial iconoclast JASSS, Magda Mayas on prepared piano and clavinet, the percussionist Robyn Schulkowsky and Schneider TM on solo guitar as well as a special guest from Helsinki. What will the results be when graphic artists from different corners of the world prepare musical scores for musicians with completely different backgrounds? How does it sound whena vintage graphic technique becomes the starting point for musical improvisation? What happens when music is being composed by graphic artists? 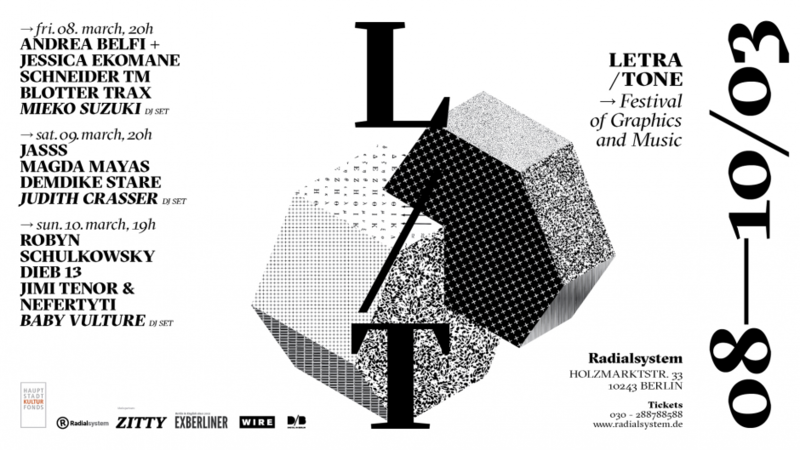 The Letra / Tone Festival will explore these questions at Berlin’s Radialsystem over the course of three days and will make a variety of answers to them accessible with a slew of concerts. The musical performances will be accompanied by an exhibition of the so called »action scores«, the graphical notation provided by Anke Fesel, Daniela Burger, Joe Gilmore, Julie Gayard, Katja Gretzinger, Scott Massey, Stefan Gandl, T.S. Wendelstein and Sulki & Min, as well as an audio-visual installation by Hanno Leichtmann and Toby Cornish. The DJs Baby Vulture, Mieko Suzuki and Judith Crasser will play experimental sets in between. The festival takes its name from the archive of Letratones from curator Hanno Leichtmann’s collection. The British company Letraset made this technique for applying textures and shades on papers popular during the 1960s. The sheets of paper from Leichtmann’s archive will be the basis for the participating graphic artists for their work and trigger a collective experiment that will once again flip the status quo on its head. A new method for the newest of music.